Try Continuous Ink System with your Brother MFC-J6510DW and make 30 times more quality prints for the same money! Pay only 0.04 USD for A-4 full color print! This multifunctional device is perfectly well both for office use and home use, alongside with all its qualities and advantages, has one but very important for user disadvantage, which is its expensive original consumables. And Continuous Ink Supply System is the best solution in this case. CISS Brother MFC-J6510DW - is the best alternative to original cartridges. Economical printing, efficient production and steady operation of the device are the advantages making CISS so popular among different activities users. You can fit this system almost to any model of inkjet printer or MFD, including, CISS for Brother MFC-J6910DW and CISS for Brother DCP-165C among the wide assortment of CISS. This genus of MFD models with A3 format is of new generation. Models of this genus provide enhanced rate and quality of printing, as well as new factions of A3 format. And cis brother mfc-j6510dw is the most significant modification of A3 format MFD of Brother Company since 2008 when Brother put on the market the first in the world multifunctional compact ink devices (MFD) Brother, of small and medium-sized businesses, as well as small and home offices orientation. Continuous Ink Supply System gives us the range of advantages, showing its efficiency in printerвЂ™s pressure, and namely in high volume documents printing or in photo printing. Thus, we can make use of the following CISS Brother MFC-J6510DW effects: firstly, the device productivity rise, at the expense of the timetable short cut, necessary for cartridge buying and replacement; secondly, there is no downtime, owing to ink sudden end; and thirdly, there is no printing head failure risk. And in addition, maintenance simplicity should be mentioned. Now, you must add some more definite color ink in the fit container, depending on its real consumption and you can make a fresh start again. Thus, you are spending money on ink only. 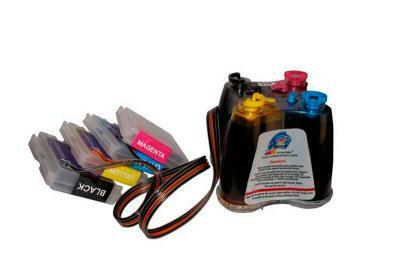 Herewith, ink cost will be several times lower than original ink cartridges cost. If, for example, 1 liter of high quality ink costs about 40 dollars, but one 10 ml cartridge is about 10 dollars, then the difference is colossal, and namely this affect printing costs. Do not forget that both and type of paper and ink quality work with quality of printing. That is why, by using of recommended ink only, for CISS ink system brother mfc-j6510dw you are getting good value for the money!